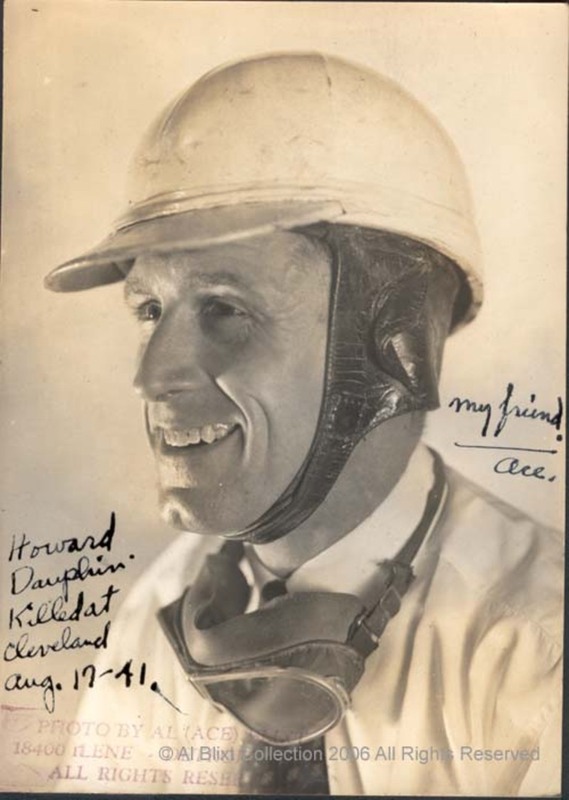 Howard Dauphin is apparently not as well remembered as some of the other driving champions of the 1930's and that's a shame. 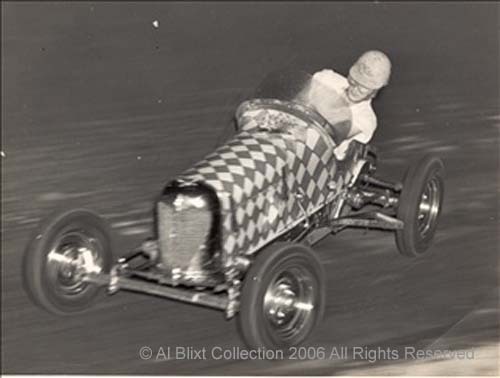 He captured many midget and big car championships in Michigan and Ohio in the 1930's. He was killed tragically in August, 1941 after an accident at Cleveland, Ohio. Read on to find out more about this colorful and well-liked driver. This feature includes the memories of Howard from his older son, Howard, Jr. who is now 79 but was 14 when his father died. The notation on this print, written by my father, reads, "Howard Dauphin Killed at Cleveland Aug. 17-41. My Friend - Ace." The year was 1932. It was the bottom of the Depression. More than a third of Americans were unemployed. Banks were failing and people were lined up in bread lines to get something to eat. If there was ever a time not to start a business, the fall of 1932 was it. So, how did it happen that a new auto racing speedway came to be built at Eight Mile and Schoenherr Road in Detroit? Here is the story of Don and Carson Zeiter and their "dream speedway"; one that would have many names; but ultimately became the legendary Motor City Speedway. "The One and Only Curly Mills" is the caption written by my father on this photo. 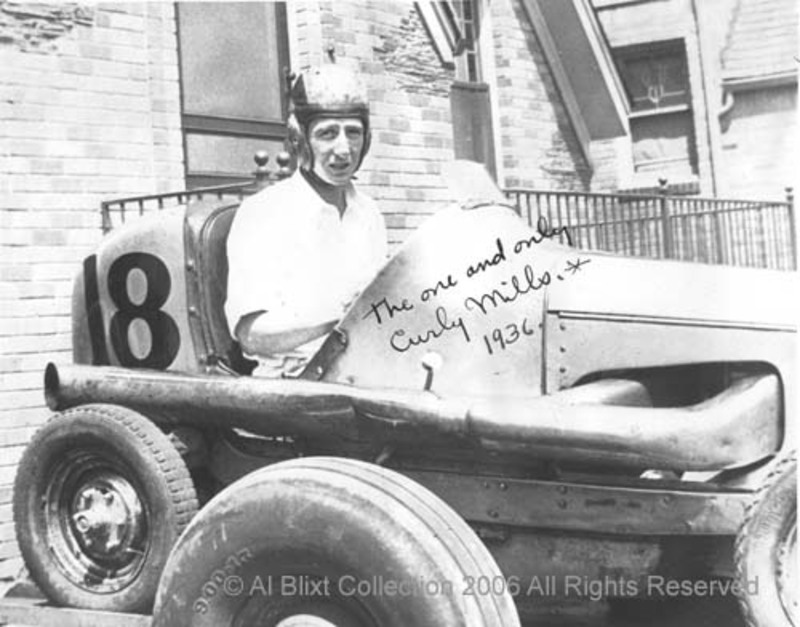 Curly was a very popular driver on the West Coast and a real pioneer in midget racing. He raced in Detroit beginning in 1935. For a photo of Curly in action and information about his life and death, read on. Johnny Ritter takes the legendary "checkerboard" Offy through the turn at Detroit's Motor City Speedway in 1937. This rare photo is connected to three stories. Read on to find out about the car, the driver and how the photo was made. 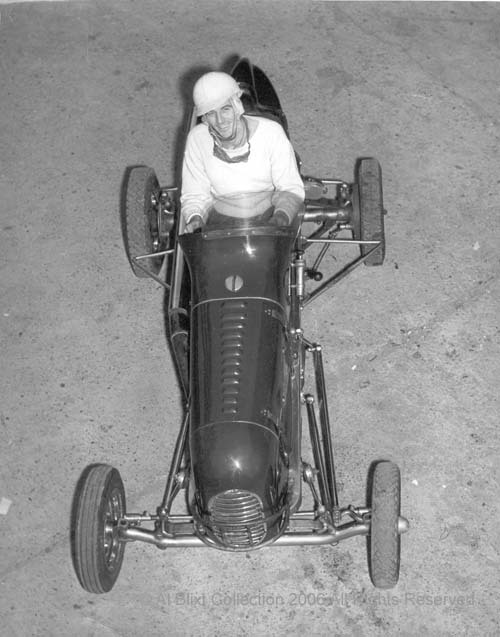 Art Hartsfeld was a champion midget driver in the Detroit area and the midwest in the post-war years and a good friend of my father. This photo offers a dramatic and unique perspective on car and driver. I am still gathering biographical information on Art but read on to see what I have uncovered so far about him along with additional photos of this handsome and well-liked driver. Henry Banks: Driver, Offical and..Movie Star? Henry Banks in his #16 midget owned by Mike Caruso about 1939 at Motor City Speedway. Henry began racing in 1932 and retired in 1954. 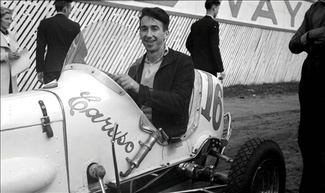 He won several championships including the 1941 ARDC Midget Championship in 1941 and the 1950 AAA National Championship. He appeared at Indianapolis seven times as a starting or relief driver. In 1959, he became the second Director of Competition for the fledgling United States Auto Club that replaced AAA as the primary national sancioning body in 1955. But, read on to find out about Henry's brief career as a movie star. Carson Zeiter: "Voice of the Speedway"
Carson Zeiter is remembered as the voice of the Motor City Speedway and rightly so. Many do not know that he and his brother designed and built the track in 1932. 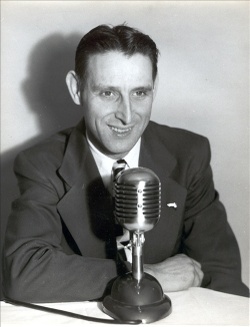 Carson began announcing there in June of 1933 (when it was called the VFW Motor Speedway) and soon he was in demand as an announcer around the country. His legendary career continued until the 1970's. He was inducted into the Michigan Motor Sports Hall of Fame in 1984. You can read his complete bio by going to MMS Hall of Fame. Read on to see more Carson Zeiter photos. 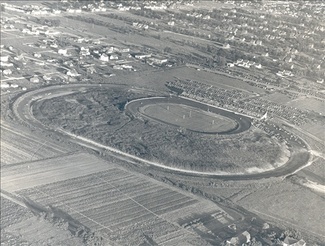 Motor City Speedway seen from the air as racing resumed after the war in 1946. The old half-mile track can still be seen with a portion serving as the pit area. Eight Mile, the border of the City of Detroit, is in the upper right while the farm fields of Macomb County can be seen in the lower left. 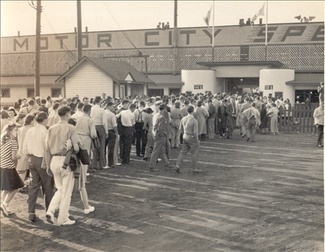 Although my dad covered auto racing throughout the midwest, his home track was Motor City Speedway. He was the official photographer in the 1930's and after WWII he assumed the role of Program Director. More about my dad's role in later posts. First, a little history as I know it. 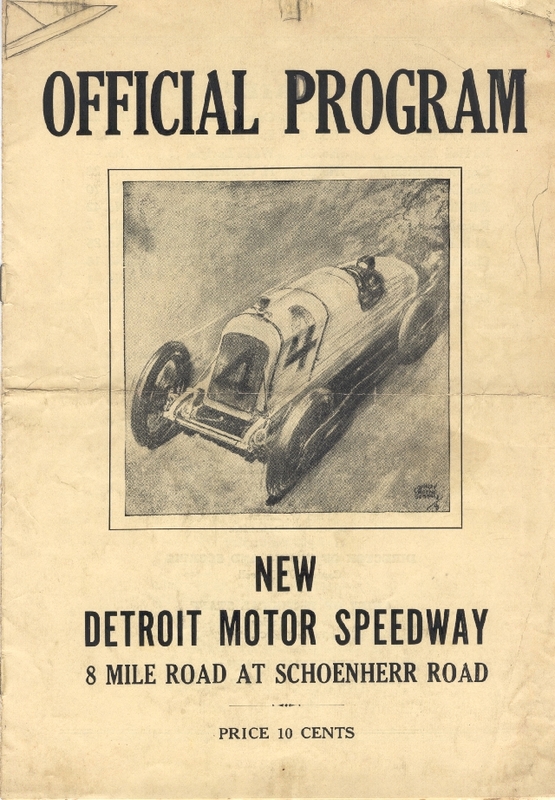 The original 1/2 mile oiled dirt oval was designed and built in 1932 by Don and Carson Zeiter just outside Detroit at Eight Mile Road and Schoenherr Road. 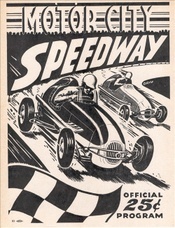 It was variously known as VFW Speedway, New Detroit Speedway and Zeiters. It was shortened to 1/4 miles in 1936 as can be seen in the photo. In 1936, the track was home to a new class of racing cars - midgets. This new specification was adopted for safety and uniformity for racing on shorter tracks and indoor arenas. Here is a typcial photo of the era that I love. 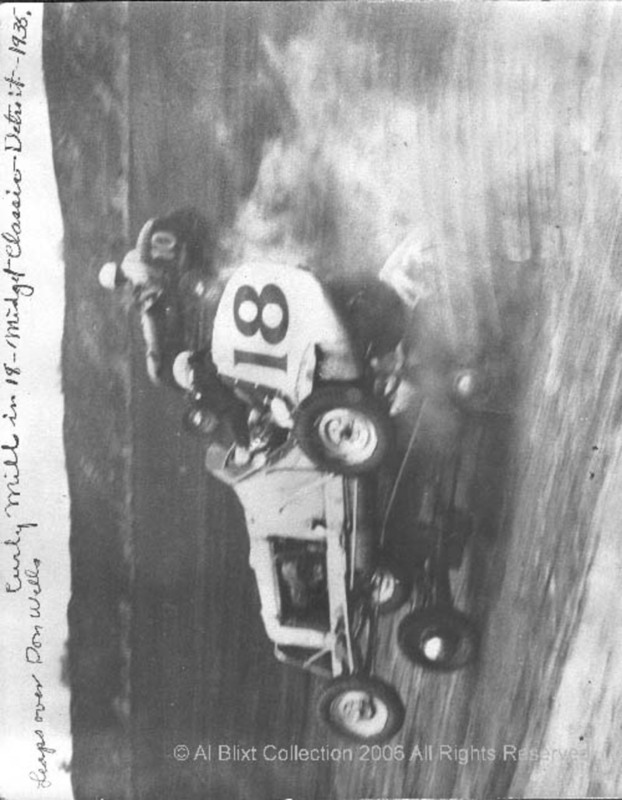 Bill Warner is pushing his midget to the edge of control, broadsliding as it was called, to gain maximum speed. This is something that can only be done on dirt tracks and it makes for spectacular racing. 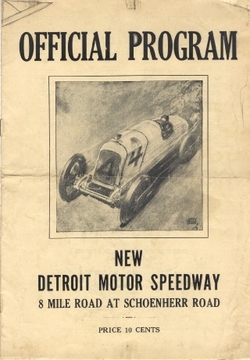 The Detroit Free Press referred to the track during its construction as the "DREAM SPEEDWAY". Seating was, I believe, around 3,000 and soon there was a full house two or three nights a week. Here you can see the people lined up, listening to the high-pitched scream of the "doodle bugs" as they were called. 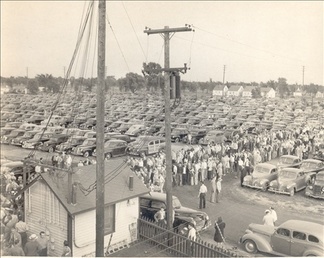 The cars were parked out to 8 mile and the crowd stretched almost as far with drivers like Eddie Ostwick, Bill Warner, Art Hartsfield, Johnny Wohlfiel, Ronney Householder and Jake Jacobson dueling every night in action so close it would take your breath away. Racing stopped in 1942 after Pearl Harbor. Gasoline and tires were rationed and many of the drivers were off to war. After Hitler and Tojo had been vanquished, the GI's came home looking to catch up on some normal American living. That, of course, included auto racing. More Motor City history soon. Comments and memories welcome.